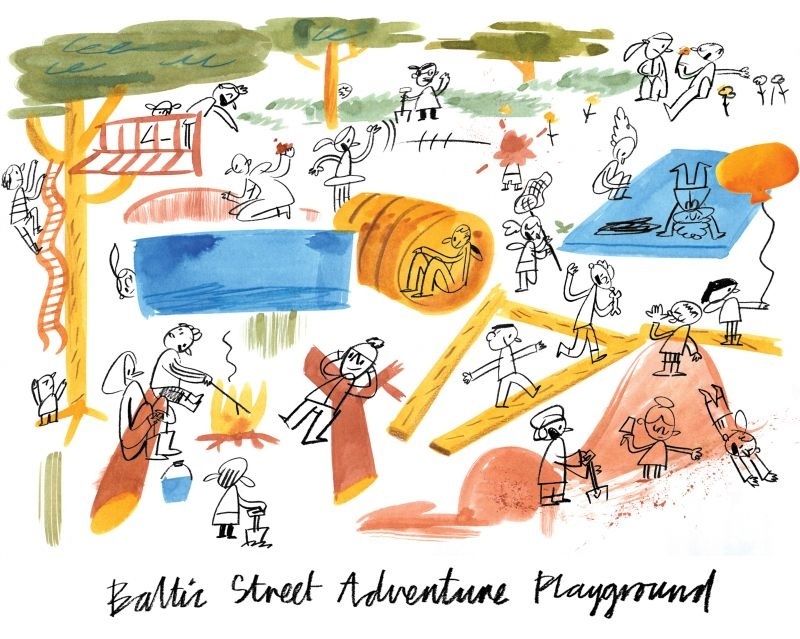 The Baltic Street Playground project shows how governance structures can be integrated with design development to improve cultural and social life. This adventure play facility in Dalmarnock Glasgow was developed by Assemble and Create London as part of the VELOCITY East End Commission and is a space made by and belonging to the local children, turning a once derelict site into a place of free, supervised outdoor play. Dalmarnock was one of the main venues of the 2014 Commonwealth games, however there had been little provision made for the young people of the area, with 55% living under the poverty line. The local community centre, football pitch and play park had been taken away leaving a great need for a space for young people. The site was derelict and had many years of neglect evidenced in the debris, needles and broken glass. Key to the project was collaboration; the community -the children and families that lived in nearby area, Dalmarnock Community Centre, First Steps Future skills, VELOCITY, Create London and Assemble were all a key part of the development and delivery of the park. Turning the process on its head was equally as important as Anthony Engi Meacock, founding member of Assemble explains, their projects “blur boundaries between the designer, builder and public. With the public becoming on-going collaborators, participants and eventual owners of the project”. Taking inspiration from post war adventure play, encouraged by Danish Landscape Architect CT Srensen who found that children seemed to be having more fun playing in bombed out sites than designed playground. Assemble and their collaborators started with an initial testing period where they built the basic infrastructure for play and saw how the children responded and engaged with it. This gave the young people the freedom to mould and shape the project, giving them a sense of ownership, and for the designers it enabled them to get feedback and see what was working and wasn’t working. Working continuously with the community to design and build the playground results in a space that encourages the children’s creativity and independence to build, adapt and change their environment to suit their needs, with play hills, tunnels and tree top dens. They’ve also been able to address the issue of healthy eating, as Dalmarnock was one of the UK’s first food desserts with no fresh food in a 20-minute radius – there is now a community garden and campfire for cooking and making fresh food. In conjunction the collective ran a wider city and national campaign arguing that this form of adventure play could occur anywhere. In summer 2014 they ran a Play Summit curated by Nils Norman and Assemble exploring the state of play in Scotland with talks, workshops and a symposium. Additionally they made small live projects around the city promoting the idea that children should be visible. This collaborative approach has encouraged a long-term outlook and enabled the integration of governance structures, for example local youth worker Robert Kennedy now works full time at the site. Establishing a sustainable organisation that can run and manage the playground ensures life beyond the development phase and enables Dalmarnock to contribute to the wider awareness-raising campaign.